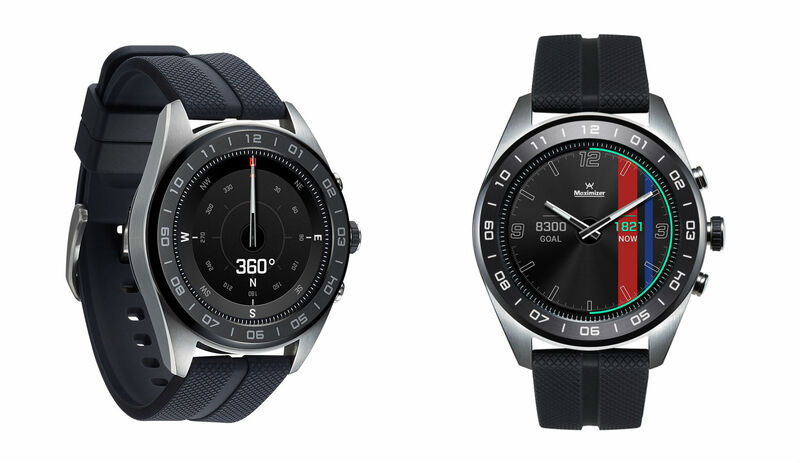 Announced alongside V40 ThinQ this week, LG introduced Watch W7. It’s a hybrid smartwatch running Google’s Wear OS, combining mechanical hands and digital functionalities. We have all of the specs right here, but to sum it up, the watch features a 1.2″ LCD display (360 x 360) with mechanical hands running on top. Inside is a Snapdragon Wear 2100 processor (yes, it’s the 2100 and not the 3100), 240mAh battery, 768MB RAM, and 4GB of storage all wrapped in a 44.5mm case size. Notably, the mechanical hands are capable of more than just telling time. With them, you can access other functions of the timepiece, such as a compass, stopwatch, timer, barometer, and altimeter. According to LG, when in a Watch-Only mode, the device is capable of 100-day battery life, compared to just 2 days when using all of its digital functions. Watch W7 will be available at Best Buy starting October 14 for $449.99, with pre-orders set to begin October 7.